THE KINGDOM OF CAMBODIA HOLDS SOME OF SOUTH EAST ASIA’S FINEST & SEVERLY UNDER-RATED CUISINE. FROM COOKING CLASSES TO FOOD TOURS AND A WIDE SCOPE OF RESTAURANT SELECTIONS, SIEM REAP IS MOST CERTAINLY NOT LACKING IN THE WORLD OF CULINARY ADVENTURES! We have been spending some time over the past few weeks listing down all our favourite things to do around town and we can promise that unless needed, idle time will not be upon you should you add a few of these truly unique experiences to your itinerary! Many thanks must go to Lara Dunston from Grantourismo for the contributions to this article! Mahob Khmer is among one of Siem Reaps best restaurants offering the opportunity to taste the Kingdoms local cuisine at a fine dining level. Alongside their incredible dining experience is their owner and Head Chefs Farm & Cuisine cooking course. Chef Sothea has an organic farm just three kilometres from the centre of Siem Reap made possible with the support from the AGRISUD International Organisation (specialist in agricultural development). Here on the farm you will find a variety of heirloom fruits and vegetables that are both fresh and organically grown without hormones, synthetic fertilisers or pesticides. This is where all the ingredients come from for both the restaurant and the cooking classes! Spending time with Chef Sothea is a truly incredible experience. Not only do you get the best tips from a Cambodian chef with years of 5 star hotel experience under his belt but you get to learn the very best of Cambodian cuisine as you hand pick your own fresh ingredients that will go into the meals your make yourself. The whole experience is extremely safe, hygenic and very well organised. Their cooking menu includes many meals that you won’t find at other cooking classes, except of course for the classic Lok Lak. This, of course, is an exception as Chef Sothea’s Lok Lak is, by far, one of the best in town and to have the opportunity of learning this incredible recipe is truly an honour. In between each meal you’ll get the opportunity to sit and enjoy each course you have personally made tailored to your own personal taste (another reason we love this class as not many do this) enjoying good wine and cold beer throughout! Classes are offered at both the restaurant and the farm, however, we suggest doing it at the Farm for a truly local experience! This photo of is courtesy of Beyond. Unique Escapes. The team at Beyond. Unique Escapes also has fantastic cooking classes available at their hotel ‘Sojourn Boutique Villas‘. Offering morning, afternoon and full-day classes you can learn how to cook local cuisine in the peaceful and tranquil surroundings of their garden. The best part about their classes is that they only take a maximum of eight people per class to create a truly intimate experience with that personal touch. 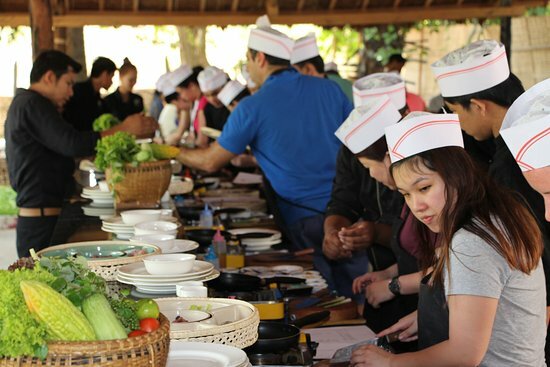 Before you get hands on you’ll be taken for a tour to visit local families and learn about the everyday herbs and vegetables that are used in Khmer cuisine and the art that goes into preparing each authentic dish. After the tour you will head back to class and be able to enjoy your self-prepared meals accompanied with complimentary ice-cold beer, soft drink, or bottled water. Photo courtesy of Pou Restaurant and Bar Facebook. Before I begin about the next food tour hosted by Chef Mengly, I highly suggest you visit his brand new restaurant ‘Pou Restaurant and Bar‘. Mengly is a young Cambodian chef who showing incredible passion and skill for traditional Cambodian cuisine all while giving it a modern and unique flare. His restaurant looks like it has been plucked from one of Melbourne’s most ‘Hipstered’ areas and boasts an air of fine dining mixed with grass roots, Khmer style creativity. Add a visit to his restaurant to your list and we assure you that you’ll be recommending it to everyone you meet! The former head chef of SPOONS is now hosting his very own street food tour everyday from 8:00am till 10:30am and trust us when we say there is no other Cambodian in Siem Reap who knows his street food quite like Mengly! Most of all don’t miss out on his weekly lunch tour every Wednesday! Start off at 11:00am with a pick up from your hotel and head to a local market outside the hustle and bustle of the Siem Reap central. It is here that you will be able to explore a genuine market place untouched by tourism then sit and soak up a local Cambodian food court enjoying different meals from five different stall holders. Mengly will take the time to explain each meal in detail breaking down its origins, ingredients and why it has been served the same way for so many years. This is a lunch time experience not to be missed if you are after a true local style culinary experience. Photo courtesy of Siem Reap Food Tours Facebook. Next up we have Lina and Steven from Siem Reap Food Tours who in 2016 got mentioned in the ‘The New York Times’ article ’36 Hours in Siem Reap’. Since then they have been featured in VOGUE, Time Out and The Telegraph. Siem Reap Food Tours offer a personally guided tour both in the morning or the evening. Heading out in small groups right into the very heart of Siem Reap they will provide you an opportunity uniquely different to learn about Cambodian life and culture. You’ll have the opportunity to sample authentic Khmer cuisine in locations rarely seen by tourists. Visiting street-side stalls and the local markets where they will introduce you to local specialties and snacks – we personally love the local exotic fruits… Rambutans and Durians Please! As quoted from the team from ‘The New York Times’ – A morning spent navigating the city’s food markets and street stalls with Scottish chef Steven Halcrow or the American writer Lina Goldberg, the two behind Siem Reap Food Tours, will vanquish any doubts you have ever had about Cambodian food. If a holiday based entirely around culinary travel and unique local experiences is what you are searching for, well look no further than the couple behind Grantourismo (https://grantourismotravels.com), the website of Siem Reaps resident food/travel writer Lara Dunston and her Photographer husband, Terence Carter. Lara has been crafting bespoke food-focused ‘Savour Siem Reap’ trip itineraries for over four years now alongside curating longer 8-10 nights of Cambodian Culinary Tours, Food and Travel Writing and Photography Retreats hosted in partnership with the best of local tour companies and Cambodian Guides (all whilst working on a Cambodian Cookbook)! A host in the pure of terms, Lara strives to ensure her experiences are truly bespoke in the best of ways. Creating itineraries to match the interest, preferences, travel style and budget ensuring each experience is truly unique. Lara and Terence are amongst the masters of what’s happing in Siem Reap and Cambodia. Be sure to check out their website for more information covering all of South East Asia, future retreats, tours and what’s hot. There really is no limit to how far you can go experiencing the local cuisine of Cambodia. If you would like to know more about what’s happening in Temple Town you can send us an email at admin@thelittleredfoxespresso.com or follow us on our Facebook. We are more than happy to share with guests the incredible passion the Kingdom of Wonder has to offer! Thanks so much for that and also thank you for always sharing your insights to what’s going on in South East Asia, your website is a saviour for true explorers! Adam, Myself and the team are just getting started with this blog so we have many exciting project ahead. Cannot wait for 2018!